The base of a getting a Russian visa is an officially formalized invitation for a foreign citizen. Each foreign citizen willing to visit Russia must register a Russian visa according to an invitation from the Russian side, depending on the aim of visit. The invitations and the ways of getting them can be various. We help to get visa without problems at Russian consulate for more than 17 years. We are located in Moscow, “Kitay Gorod” metro. Uruguay a sum of days during 180 days is no more than 90 days (since the moment of an arrival to the Russian Federation). Venezuela a sum of days during 180 days is no more than 90 days (since the moment of an arrival to the Russian Federation). An invitation letter is a base of getting a visa to the Russian Federation, or to arrive without a visa (in legal cases). A visa is an obligatory document, which must be registered by each foreign citizen who arrives to the Russian Federation territory. A process of getting a visa to Russia. Invitation letters for foreign citizens. A foreign citizen can get a visa at the Russian consulate at his or her place of living. A visa to Russia is given according to the official invitation letter, which is formed by the MFA or the FMS of the Russian Federation. The second option to get visa (touristic visa) is an invitation letter from the touristic company, which has such kind of power. Having necessary documents and permissions, some companies can make such type of invitations. Types of visa to Russia. How to choose the right type of visa? A person who is interested in getting a Russian visa should give an invitation letter, which includes detailed or even full information about him. One can receive a full consultation on necessary information for an invitation letter in Russian consulates or in the special agencies and also with the help of the special web-resources.The most suitable option for those, who want to stay in Russia for no longer than 30 days, is to register touristic visa. To get such kind of visa it’s necessary to register an invitation letter of a touristic voucher from Russian side. Then a person can get visa in the Russian consulate without any problem.One should register a visa during 3 working days after arrival to the Russian Federation. A registration is an obligatory procedure for everyone who arrives to Russia. It’s necessary to have an identification document(ID) and a migration card stamped by the Border Control Agency. The Russian visa has to be registered during 7 work days after arrival. The registration of Russian visa is an obligation of foreign citizen arrived to Russia. To register the International passport and the migration card with all the stamps of customs controlling the incoming process is required. A process of a registration touristic voucher and touristic visa to Russia. As it was already mentioned, the basis of getting tour visa is the tour voucher, what is actually the invitation. A touristic visa is required in case of tourism, visiting culture or health institutions, enjoying entertaining and sport events. Usually it gives no special case for formalizing touristic visa to Russia, so visa supporting centers can formalize that identification document very fast. It is much easier to get the invitation or tour voucher and takes several hours. That visa allows to cross Russian border one or two times, so it could be formalized as double. Some cases show that it is really necessary to visit the Russian Federation twice, for example special treatment at Russian Health Institutions, so double-entry visa to Russia is very convenient, as it helps to avoid the double formalization process including the same documents and the same invitation. If the double-entry visa is required, it has to be mentioned in the invitation. The necessity of double-entry is better to be mentioned in the invitation to ease the further operations for consulate workers. It is possible to formalize the invitation or visa to Russia even via tour agency’s website. To do so it’s necessary to fill in the worksheet and to cooperate with the visa center on the documents transfer. The touristic visa is made based on the copy of touristic invitation by almost all Russian consulates. So if your purposes match the tour visa, this is the best solution. The tour visa’s registration process is much easier than of business visa and also even less expensive. The easiest way to get the permission to visit Russia on the short-term and urgent basis is to get the tour invitation and then tour visa to Russia. Business visa to Russia. Formalization of business invitation. If you are planning to do business including your participation within Russian territory you will have another requirement comparing to the tour visa. 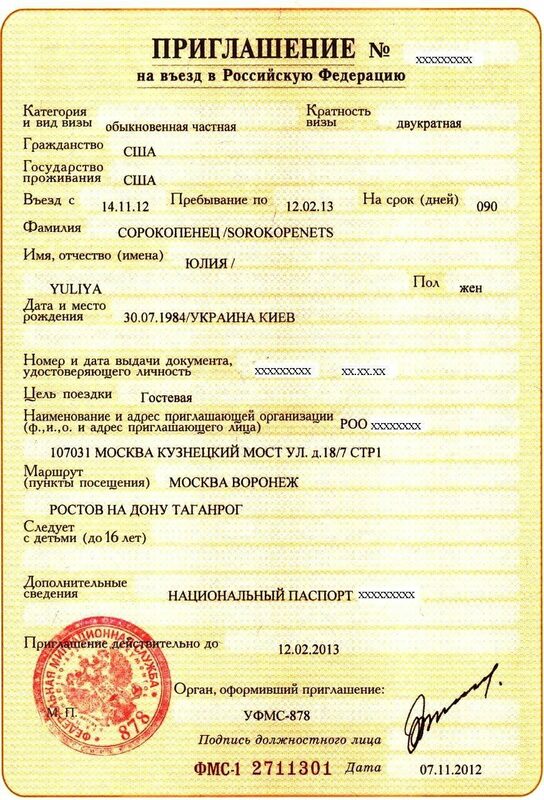 The business invitation is the first obligatory document to get business visa to Russia. A business visa to Russia is of a limited period, which is required for business purposes. That period and other relevant details of business trip has to be mentioned in the invitation. There are 3 types of business visa: Single is the best solution for the short-term single visit with business purpose. Double visa is applicable for double visit including 90-days residence. Multiple visa is the most comfortable for frequent trips. The limit of residence is 3 month of the each half of the year. To apply it is necessary to address Russian consulate having the formalized business invitation. Special visa support centers can offer help in getting business invitation, most of them operate online. To get the invitation and then visa to Russia it is necessary to fill-in the special worksheet and to attach the colored passport copy. The formalization of visa online is possible for all types mentioned: single, double or multiple. The period depends on the aim of visit, type of visa and the information relevancy. 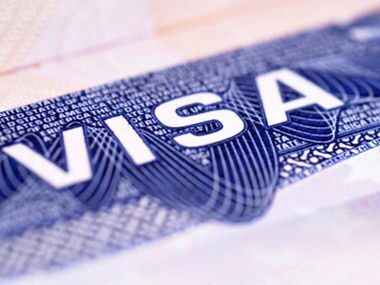 Usually it takes from 2 to 22 working days for visa support center to proceed the invitation and then issue visa. As it was mentioned, it is necessary to get the basic document to issue visa. That basis is the invitation –a visa designation sent by telex or by post in the original form. The invitation is issued in FMS or MIA. The invitation sent by telex saves much more time during the visa registration process in comparison to the invitation sent in the original form. Due to this the costs of that invitation are higher. It takes from 5 to 7 days using speed-up and 12 days with standard procedure to get single or double-entry visa. It takes at least two weeks from the application to receive an invitation for multiple visa, although some cases allow to formalize business visa much faster. Mostly it depends on the operations of the applied agency. The invitation can be formalized on the special official paper, that has several protection levels. This type you can receive in FMS. Today the electronic version is also applicable. Having the official invitation paper or its electronic version you may easily apply to the nearest consulate of Russia. A work visa and Russian work permit. A foreign citizen has to formalize work visa to work in Russia on the legal basis. The inviting company is responsible to formalize the invitation. The company has to prepare the full set of documents to get Russian visa. The first step in formalizing of the invitation is the application that confirms the purpose of working time spending in Russia. Then the next stage – getting working permission to each specialist begins. Formalizing working permission is a basis to apply for an invitation. The validity period for the invitation is no longer than 90 days. The purpose to be mentioned is strictly – “journey-work”. 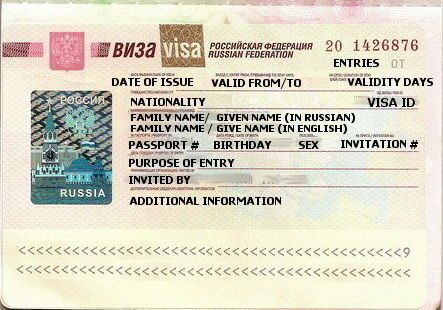 Further is the full list f documents needed to formalize Russian working visa at the Russian consulate: The original invitation paper (the residence period is no longer than 90 days, the purpose – “jurney work”) Working permission with the photo, passport details, the validity period and the inviting company details Visa blank Insurance Set of photos After the arrival to Russia the worker has to prolong the visa. In this case the prolongation period equals to the period mentioned in the working permission. The multiple-entry visa for one year would be stamped in the international passport. Even though the procedure described above looks very simple, practically people get lots of difficulties while proceeding. The change in the documents’ formalization process, correcting the operating procedure and operating queues slow down the process of getting the invitation. The inexperienced person faces lots of problems while proceeding the invitation issuance, so the services of visa centers got more popular. These centers help to formalize the invitation and visa to Russia. They get permission documents for individuals and companies willing to invite foreign specialists very fast. Visa support centers offer their help to formalize invitations and vorking visa to Russia for specialists from any place of origin. There are other types of visa apart from business, working and tour existing – the student’s visa among them. A student’s visa is issued to the foreign citizen willing to study or for the short-term education program in Russia. The basic document is the invitation, that has to be issued by the inviting institution. The institution has to be registered at the state registry of Russia. Normally the validity period for student’s visa is 90 days. If the education period is longer, then it can be prolonged up to one year with the correspondence to the agreement. The responsible agency to prolong visa is MIA referred to the place of registration. The transit visa is required for the foreigners who have to cross Russian border during their trip. It proves the legal border-cross. The other case where the transit visa is necessary is the evacuation of the foreign citizen stayed according to non-visa regulation from Russian territory. The validity period is 10 days. If the foreign citizen uses the aircraft the validity period of the transit visa is no longer than 3 days. If the flight with no stops the visa registration is not required. In case of driving the car the transit visa validity is for the shortest itinerary. The base is the tickets confirming the itinerary crossing the border. Te valid transit visa for other country can also be a documental proof. Visa to Russia The purpose to get visa can also be humanitarian. Such visa is called humanitarian visa. The visa is issued while having humanitarian purpose or for charity, religion or creative actions. A person who is maintaining contacts in religion, sports and culture can also get the invitation and humanitarian visa. The visa is based on the invitation in Russian consulate, referred to the place of citizen’s residence. The humanitarian visa can be of 3 types depending on how many times a person would like to enter the country. It could be single, double (up to 90 days) and multiple. The multiple visa is valid till 1 year. The whole period of residence within Russian territory cannot be longer than 180 days. As it was already mentioned, the basic document to issue the visa is the invitation. However, there is the exception supported by the law. A visa can also be issued based on the personal application form, supported by the permission to issue the visa from the head of the diplomatic institution of Russia.